Olympus Has Fallen was an action movie that came out of nowhere. Billed as Die Hard in the White House, the early 2014 release leveraged star Gerald Butler to great effect, letting his foul mouth and penchant for excessive violence run wild. Needless to say, the film was a surprise hit, so much so that it warranted a sequel. 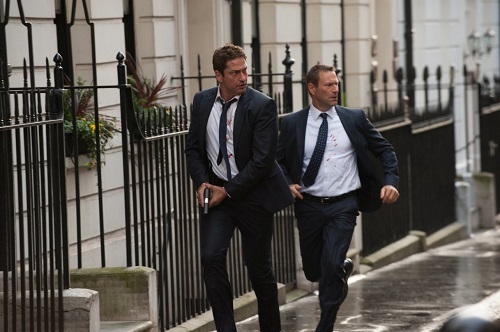 However, because the novelty of the White House under attack was gone, Butler & Co. have returned with London Has Fallen, a similar, terrorists-have-the-upper-hand situation, but played out on a grander scale in the streets of London. Unfortunately, by expanding the film’s reach, London Has Fallen loses much of its luster. Where the original film felt like a send-up of Die Hard, this one feels more like a generic action movie, albeit with higher stakes. Butler, who returns as Secret Service agent Mike Banning, is once again forced to protect President Benjamin Asher (Aaron Eckhart), only this time on foreign soil. An arms dealer with a vendetta has wiped out nearly every world leader of all the major foreign powers, and only President Asher is left. And so he and Banning have to try to survive while the London streets are overwrought with terrorists. Once again, the ‘Has Fallen‘ franchise begins with a bang, but this time it struggles to deliver consistent thrills. By eliminating the intimate setting of the White House, the film becomes more of a mixed bag in terms of its action. There are times when London Has Fallen does echo the tone of its predecessor, most notably when Banning takes on a house filled with baddies in pure darkness, but even then the novelty seems to have worn off. And when the film tries to make use of its bigger budget, that mostly means a series of dull shootouts. 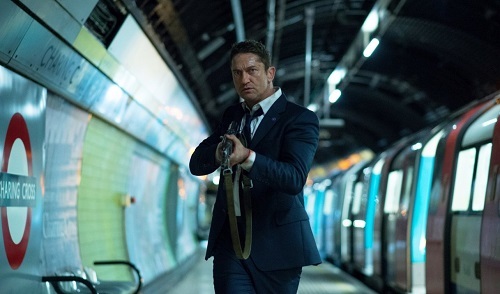 Story-wise, London Has Fallen is generic B-level action movie fodder. There’s a terrorist out for revenge and a fight for survival and that’s about it. There isn’t much discovery in the film and most of the actual intrigue comes from wondering if Banning and Asher will make it out alive. The character work is razor thin and the one plot twist that is in the film is handled so poorly it actually feels like part of a reshoot. Anyone going into London Has Fallen expecting to be entertained on anything more than a visceral level will come away disappointed. But even then, London Has Fallen stands out as the movie most thought Olympus Has Fallen would be: a generic action flick released during the early part of the year. There are some flashes of what made ‘Olympus‘ a surprise hit in ‘London,’ but they are few and far between. The story is lifeless and most of the characters are one-note. London Has Fallen raises the stakes but doesn’t preserve the spirit, and that’s where it will ultimately lose its audience. There isn’t much to say about London Has Fallen‘s action aside from “it is passable.” There are enough exciting moments to keep the film from becoming boring, but few would say they are inventive or creative. As was mentioned, the original film found success by keeping the action intimate and surprisingly violent, whereas ‘London‘ goes for the bigger scale shootouts and set pieces. Unfortunately, bigger scope does not mean more creativity, as the chase scenes and shootouts lack punch. London Has Fallen‘s action is serviceable but it’s not memorable. It will get the job done as a rental, but for a full-priced feature, the film should have been better.